It was the book trailer for this book that attracted me, but I won't show it here. Instead, I'll refer you to Bermudaonion's blog, since that's were I first saw it. I don't know if I should thank her or not. Just reading Gesine Bullock-Prado's Confections of a Closet Master Baker could add five pounds. It's that luscious. Somewhere in life, Gesine Bullock-Prado was sidetracked. She spent so much of her childhood in Europe, accompanying her German opera singer mother, that she was exposed to wonderful German baked goods. She admits she was obsessed with sugar as a child, and she should have known early-on that she was destined for pastries. (She still remembers details of confections she had as a child.) Instead, she moved to California to be with her sister, actress Sandra Bullock, and then, upon graduation from law school, became a film developer. She ran her sister's production company for nine years, although she hated everything about Hollywood, except Sandra, and Ray, the film illustrator she married. Fortunately for her, and the citizens of Montpelier, Vermont, Gesine took her Hollywood frustrations out by baking. With plans to take classes to be a master baker, Gesine and her husband bought and renovated a shop in Vermont, pouring all of their savings into Gesine Confectionary. And, this book is the story of that journey to bakery heaven. Gesine takes the reader through a day at the bakery, introducing us to her staff, the customers, and, most of all, her pastries. As she charts the course of the day, she fills in the day with the appropriate recipes. There are ones for standards such as scones, sticky buns, and focaccia. But, there are also magical recipes for Golden Eggs, Espresso Cheesecake, and a plum tart called Zwetschgendatschi. It's hard to put this book down without wanting to head to a good bakery, preferably Gesine Confectionary in Vermont. However, Gesine and her husband, Ray, sold the bakery at the end of 2008. Since you can't get there now, Gesine Bullock-Prado will allow you to visit, in the delectable book, Confections of a Closet Master Baker. 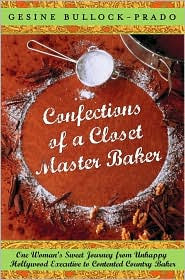 Confections of a Closet Master Baker by Gesine Bullock-Prado. Broadway Books, ©2009. ISBN 9780767932684 (hardcover), 240p. Seventh thing about me you didn't know - Before grad school, I worked as a high school librarian, renting a room from an Armenian immigrant. She baked the most heavenly apple strudel I ever had, making it from scratch. It was quite a sight to walk into her kitchen, and find her with pastry rolled paper thin on her entire table. Aaahhh. The perfect landlady - a baker. I saw this over at Bermudaonion's blog and fell in love with it. I really want to read it. Bermudaonion's blog attracted me to the book, too, Vivienne. It's hard to resist this book. Oh yum. I'll have to read this one...I've been getting into foodie books lately. I read this book during the fall read-athon and loved it as well. I think the one truth that came through loud and clear to me is that if you are doing something that you absolutely love --- it doesn't feel like work. She puts in such long days, and yet she is so content. I'm so glad you liked this book. I loved that Gesine followed her passion instead of money. Thanks for linking to me. Sounds like you did have a "sweet" set up with your landlady. The books also sounds wonderful. I love baked goods and anything dealing with them. This one will go on my wish list for sure and I'm popping over to visit the blog you mentioned. Thanks for sharing the book, the site and #7. Oh, and my Armenian landlady did alterations as well, Elizabeth. For someone as short as me, that was a blessing, too. I've been enjoying foodie books lately, too. Must be as a result of all those mysteries with food! Did you catch the fact they closed the bakery? I hope she's just as happy with the restaurant in Texas! Thanks for the heads up on the book, Bermudaonion! I'm glad you led me to it. And, I enjoyed the video! You're welcome, Mason. You're going to enjoy the video on Bermudaonion's site! Oh, she was a very good landlady. This one is on my wish list for sure. Everything about it sounds wonderful. I grew up in Germany, and while I don't miss much about it, I do miss the German pastries. Even after more than a quarter of a century in this country, I still haven't found anything that compares. Oh, Ingrid! I think you're really going to enjoy this book with her memories of German pastries. Definitely should be on your wish list. And, I envy you. I'd love to try those German pastries! I hope you enjoy it, Rob. Wonderful foodie book! Thanks!